Selective attention is the process of focusing on a particular object in the environment for a certain period of time. Attention is a limited resource, so selective attention allows us to tune out unimportant details and focus on what really matters. How Does Selective Attention Work? At any given moment, we are subjected to a constant barrage of sensory information. The blare of a car horn from the street outside, the chatter of your friends, the click of the keys as you type a paper for school, the hum of the heater as it keeps your room warm on a brisk autumn day. But in most cases, we don't pay attention to each and every one of these sensory experiences. Instead, we center our attention on certain important elements of our environment while other things blend into the background or pass us by completely unnoticed. So how exactly do we decide what to pay attention to and what to ignore? Imagine that you are at a party for a friend hosted at a bustling restaurant. Multiple conversations, the clinking of plates and forks, and many other sounds compete for your attention. Out of all these noises, you find yourself able to tune out the irrelevant sounds and focus on the amusing story that your dinner partner shares. How do you manage to ignore certain stimuli and concentrate on just one aspect of your environment? This is an example of selective attention. Because our ability to attend to the things around us is limited in terms of both capacity and duration, we have to be picky about the things we pay attention to. Attention acts somewhat like a spotlight, highlighting the details that we need to focus on and casting irrelevant information to the sidelines of our perception. "In order to sustain our attention to one event in everyday life, we must filter out other events," explains author Russell Revlin in his text Cognition: Theory and Practice. "We must be selective in our attention by focusing on some events to the detriment of others. This is because attention is a resource that needs to be distributed to those events that are important." There are two major models describing how visual attention works. The "spotlight" model works much like it sounds—it proposes that visual attention works similar to that of a spotlight. Psychologist William James suggested that this spotlight includes a focal point in which things are viewed clearly. The area surrounding this focal point, known as the fringe, is still visible, but not clearly seen. Finally, the area outside of the fringe area of the spotlight is known as the margin. The second approach is known as the "zoom-lens" model. While it contains all the same elements of the spotlight model, it also suggests that we are able to increase or decrease the size of our focus much like the zoom lens of a camera. However, a larger focus area also results in slower-processing since it includes more information so the limited attentional resources must be distributed over a larger area. Some of the best-known experiments on auditory attention are those performed by psychologist Colin Cherry. Cherry investigated how people are able to track certain conversations while tuning others out, a phenomenon he referred to as the "cocktail party" effect. In these experiments, two auditory messages were presented simultaneously with one presented to each ear. Cherry then asked participants to pay attention to a particular message, and then repeat back what they had heard. He discovered that the participants were able to easily pay attention to one message and repeat it, but when they were asked about the contents of the other message, they were unable to say anything about it. Cherry found that when contents of the unattended message were suddenly switched (such as changing from English to German mid-message or suddenly playing backward) very few of the participants even noticed. Interestingly, if the speaker of the unattended message switched from male to female (or vice versa) or if the message was swapped with a 400-Hz tone, the participants always noticed the change. Cherry's findings have been demonstrated in additional experiments. Other researchers have obtained similar results with messages including lists of words and musical melodies. Theories of selective attention tend to focus on when stimulus information is attended to, either early in the process or late. One of the earliest theories of attention was Donald Broadbent's filter model. Building on the research conducted by Cherry, Broadbent used an information-processing metaphor to describe human attention. He suggested that our capacity to process information is limited in terms of capacity, and our selection of information to process takes place early on in the perceptual process. In order to do this, we utilize a filter to determine which information to attend to. All stimuli are first processed based upon physical properties that include color, loudness, direction, and pitch. Our selective filters then allow for certain stimuli to pass through for further processing while other stimuli are rejected. Treisman suggested that while Broadbent's basic approach was correct, it failed to account for the fact that people can still process the meaning of attended messages. Treisman proposed that instead of a filter, attention works by utilizing an attenuator that identifies a stimulus based on physical properties or by meaning. Think of the attenuator like a volume control—you can turn down the volume of other sources of information in order to attend to a single source of information. The "volume" or intensity of those other stimuli might be low, but they are still present. In experiments, Treisman demonstrated that participants were still able to identify the contents of an unattended message, indicating that they were able to process the meaning of both the attended and unattended messages. Other researchers also believed that Broadbent's model was insufficient and that attention was not based solely on a stimulus's physical properties. The cocktail party effect serves as a prime example. Imagine that you are at a party and paying attention to the conversation among your group of friends. Suddenly, you hear your name mentioned by a group of people nearby. Even though you were not attending to that conversation, a previously unattended stimulus immediately grabbed your attention based on meaning rather than physical properties. According to the memory selection theory of attention, both attended and unattended messages pass through the initial filter and are then sorted at a second-stage based upon the actual meaning of the message's contents. Information that we attend to based upon meaning is then passed into short-term memory. More recent theories tend to focus on the idea of attention being a limited resource and how those resources are divvied up among competing sources of information. Such theories propose that we have a fixed amount of attention available and that we must then choose how we allocate our available attentional reserves among multiple tasks or events. "Attentional-resources theory has been criticized severely as overly broad and vague. Indeed, it may not stand alone in explaining all aspects of attention, but it complements filter theories quite well," suggests Robert Sternberg in his text, "Cognitive Psychology," in summarizing the different theories of selective attention. "Filter and bottleneck theories of attention seem to be more suitable metaphors for competing tasks that appear to be attentionally incompatible... Resource theory seems to be a better metaphor for explaining phenomena of divided attention on complex tasks." A number of factors can influence selective attention in spoken messages. The location from where the sound originates can play a role. For example, you are probably more likely to pay attention to a conversation taking place right next to you rather than one several feet away. 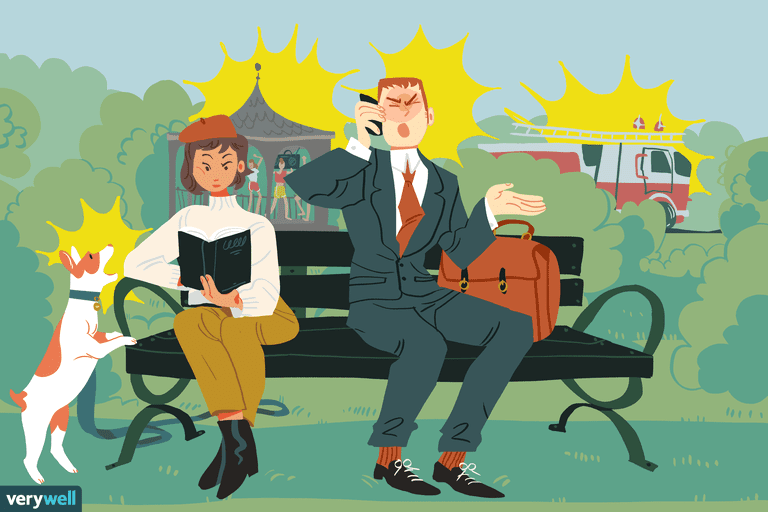 In his text, "The Psychology of Attention," psychology professor Harold Pashler notes that simply presenting messages to different ears will not lead to the selection of one message over the other. The two messages must have some sort of non-overlap in time in order for one to be selectively attended to over the other. As mentioned previously, changes in pitch can also play a role in selectivity. The number of auditory selections that must be tuned out in order to attend to just one can make the process more difficult. Imagine that you are in a crowded room and many different conversations are taking place all around you. Selectively attending to just one of those auditory signals can be very difficult, even if the conversation is taking place nearby. Learn more about how attention works, some of the things you can do to improve your attention, and why we sometimes miss what is right in front of us. Broadbent, D. (1958). Perception and Communication. London: Pergamon Press. Cherry, E. C. (1953). Some Experiments on the Recognition of Speech With One and With Two Ears. Journal of the Acoustical Society of America, 25, 975–979. Revlin, R. (2013). Cognition: Theory and Practice. New York: Worth Publishers. Sternberg, R. J. (2009). Cognitive Psychology. Belmont, CA: Wadsworth. Treisman, A., 1964. Selective Attention in Man. British Medical Bulletin, 20, 12-16. How Do Psychologists Define Attention? What Does It Mean to Be Habituated to Something?